Wetlands are important feeding grounds and nurseries for land, marine and freshwater animals. Hundreds of bird species depend on wetlands around the world as part of their life cycle. Migratory birds travel to the Port Phillip Bay and Western Port wetlands from as far away as Alaska, Siberia, China and Japan. The Ramsar Protection Program works to protects two Victorian wetland sites of international importance – Port Phillip Bay (western shoreline) and Western Port. These wetlands comprise over 81,000 hectares and support a wide range of native plants and animals of very high conservation significance. The Convention on Wetlands of International Importance, also known as the Ramsar Convention, is an international agreement promoting the conservation and wise use of wetlands.⠀Signed in 1971, the convention recognises that wetlands are a critical part of our environment and aims to halt their worldwide loss through sustainable management.⠀The Port Phillip and Western Port region is home to three Ramsar-listed wetlands – Port Phillip Bay (western shoreline), Western Port, which are the focus on the Ramsar Protection Program, and Edithvale-Seaford Wetlands, which is managed by City of Kingston, Frankston City Council and Melbourne Water. The Ramsar Protection Program aims to reduce threats to the region’s Ramsar-listed wetlands, such as pest plants and animals, and increase community understanding of the importance of wetlands and how to protect them. Specialist programs include fox and rabbit control, weed control and fencing. Partners including Parks Victoria, Hobsons Bay City Council, Mornington Peninsula Shire Council, French Island Landcare Group, Phillip Island Nature Parks, Western Port Biosphere, City of Casey and Bass Coast Landcare Network. These organisations plan and coordinate their pest animal and plant control and work together to achieve optimum results across the sites. The Ramsar Protection Program and its partners undertake a wide range of community engagement activities of the environmental values of the Port Phillip Bay (western shoreline), Western Port. The success of the program is due to the active cooperation of people and organisations. 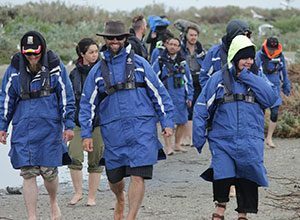 Every year, the Ramsar Protection Program runs a Shorebird and Wetland Conservation Training Program for Indigenous Australians that are interested in learning more about the region’s Ramsar wetlands and the shorebirds that inhabit them. The training program showcases to participants the management actions that help protect wetlands and manage the threats to these sensitive ecosystems. Port Phillip Bay’s western shoreline is widely utilised by the community, with dog walking, running, cycling, bird-watching and swimming occuring on a daily basis. However, parts of the shoreline and wetlands are also used by shorebirds that migrate to the region over Australia’s warmer months. They come from as far away as Alaska, Siberia, China, Japan and Korea and rely on the health of the wetlands for their survival. 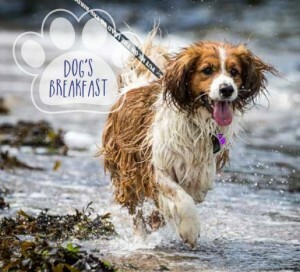 To educate dog owners on the important ecological and environmental values of the Port Phillip Bay shoreline, the Port Phillip & Westerport CMA and Hobsons Bay City Council teamed up to host ‘Dog’s Breakfast’ – a free event at Altona Beach for local residents and visitors. The Ramsar Protection Program is being delivered over a five year period (2013-18) with funding of $3 million from the Australian Government through the National Landcare Program. For more information contact Andrew Morrison on 03 8781 7960 or andrew.morrison@ppwcma.vic.gov.au.